A high-quality listening environment is vital to any educational facility. And our expertise in this area garners high honors. We specialize in creating spaces that promote clear instruction, dialogue, discussion, and interactive activities in any educational venue—from small classrooms to large lecture halls, expansive auditoriums to intimate performance spaces. Employing innovative measure for new design and adaptation of existing structures, our experts enhance acoustics, speech, sound and audio/visual tools, while controlling background noise. We can help you create controlled sound environments that promote clarity of messages, focus, concentration, and interaction. The design solution included the installation of durable sound absorbing materials in proper proportion, as well as the construction of appropriate sound reflective and diffusing surfaces at walls. 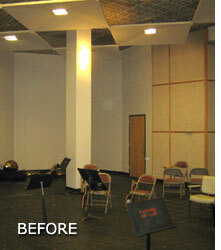 The ceiling height was increased, and finished with alternating sound reflective/diffusing and absorbing materials. This medium sized existing multi-use building houses a Popular Style music education studio (for students learning guitar, bass, percussion and keyboard skills) at the lower level, with business offices at the upper floors. Project goals included attenuating sound generated in the lower level music school from being audible in the upper office spaces, as well as preventing the transmission of sound between the many individual private studios within the music school�s suite. 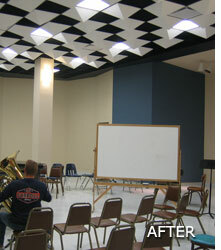 In the new high school building, the band, choir and individual private practice rooms adjoin at common walls. 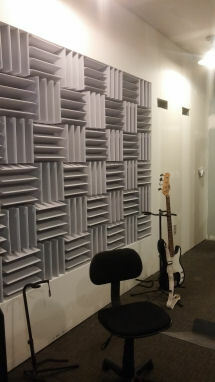 Unwanted high levels of sound transmitted between the various rooms make music learning and rehearsal difficult. Testing was performed to determine the exact amounts/intensities of transmitted sound and to determine the routes of sound transmission. Recommendations to reduce unwanted sound transmission included the installation of sound absorbing materials, sound barriers and the rerouting and sealing of HVAC ducts. The Skoglund Auditorium is the largest indoor space on the campus of St. Olaf College. In addition to sporting events, the room houses large concerts, lectures and the Annual St. Olaf Choir Christmas Music Festival. The festival is performed live as well as recorded for audio and video. 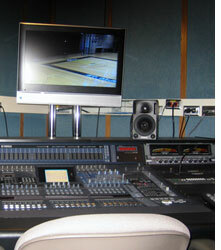 A new sound recording system, utilizing some existing components, was designed. The consultation included all system specifications, block diagrams, power and conduit site preparation data, as well as supervision and acceptance testing of the installed system.